Wentz (back) is still working his way back to health and hopes to be ready for OTAs in May, Jeff McLane of The Philadelphia Inquirer reports. GM Howie Roseman said Monday that he wants to sign Wentz (back) to an extension, Eliot Shorr-Parks of Sports Radio 94 WIP Philadelphia reports. "We have to be realistic about the fact that we have a quarterback we want to pay and we want to extend long term," Roseman relayed. "We want to have a team led by a franchise type of quarterback. We know that we have that in Carson." 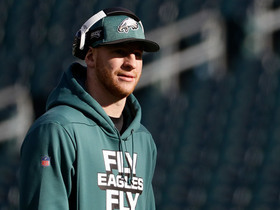 Eagles general manager Howie Roseman isn't ready to discuss a timeline for Wentz's return from a back injury, Eliot Shorr-Parks of Sports Radio 94 WIP Philadelphia reports. Analysis: Held out for the final three games of the regular season as well as two playoff contests, Wentz didn't end up needing surgery for the stress fracture in his back. A report in mid-January suggested he should be ready for the start of the offseason program in mid-April, while fellow quarterback Nick Foles is expected to find a new home before that time. Even if doesn't have full clearance for OTAs and minicamp, Wentz should be 100 percent before the start of training camp in late July. Wentz (back) is expected to return to full health by the start of the Eagles' offseason program in April, Adam Schefter of ESPN reports. 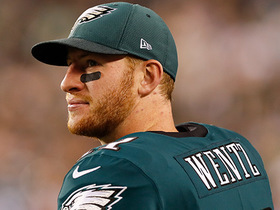 Wentz will be the Eagles' starting quarterback in 2019, Tim McManus of ESPN reports. Coach Doug Pederson said Wednesday that Wentz (back) is "still getting better" and noted that the team is waiting for the quarterback to gain clearance from doctors before bringing him back as a practice participant, Daniel Gallen of The Harrisburg Patriot-News reports. Coach Doug Pederson confirmed Monday that Wentz (back) would remain out of the Eagles' divisional-round matchup with the Saints this weekend, Zach Berman of The Philadelphia Inquirer reports. Analysis: Pederson noted that Wentz is "still getting healthy" while recovering from a fractured back, paving the way for Nick Foles to make a fifth straight start under center Sunday while Nate Sudfeld works as the No. 2 quarterback. The Eagles have thus far resisted moving Wentz to injured reserve, though all indications are that he won't be available at any point during the Eagles' playoff run. Wentz (back) isn't expected to be available for the postseason should the team qualify, Ian Rapoport of NFL Network reports. Coach Doug Pederson confirmed that Wentz won't be available for Sunday's regular-season finale in Washington and will be evaluated early next week, Eliot Shorr-Parks of Sports Radio 94 WIP Philadelphia reports. The Eagles listed Wentz (back) as a non-participant in practices Wednesday through Friday. Analysis: This merely confirms coach Doug Pederson's stated expectation from earlier in the week. Wentz is hoping the stress fracture in his back will improve with rest, potentially allowing for a return Week 17 against the Redskins or during the playoffs. Nick Foles will receive a second straight start in Sunday's home game against the Texans. Coach Doug Pederson said Wednesday that he expects Wentz (back) to do the same amount of work this week as he did during Week 15, Daniel Gallen of PennLive.com reports. Analysis: Wentz was a non-participant in practices last Wednesday though Friday with the stress fracture in his back, so Pederson's comments suggest the quarterback won't advance to even limited activity this week. The Eagles already named Nick Foles as their starting quarterback for Sunday's game against the Texans, and it looks increasingly likely that they'll stick with the reigning Super Bowl MVP as their top signal-caller the rest of the way in order to give Wentz ample recovery time from the injury. Wentz may need three months to fully recover from the stress fracture in his back, but he hasn't been ruled out beyond Week 16, Tim McManus of ESPN.com reports. 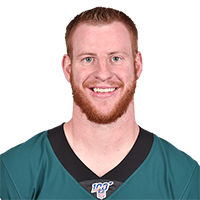 Wentz (back) has been ruled out for Week 16 against the Texans, but he won't be placed on injured reserve, Daniel Gallen of The Harrisburg Patriot-News reports. Analysis: Coach Doug Pederson said Wentz is now considered week to week, though the team's latest information on his back injury is favorable. Nick Foles will get at least one more start after completing 77.4 percent of his passes for 8.7 yards per attempt in Sunday's 30-23 win over the Rams. A loss to the Texans would essentially kill the Eagles' playoff chances and thus eliminate any hope for Wentz to return this season. Coach Doug Pederson left the door open for Wentz (back) to return for Week 16 against the Texans, Eliot Shorr-Parks of Sports Radio 94 WIP Philadelphia reports. "You know it's something we're going to take a look at," Pederson said Monday morning. "We're still gathering some information today and tomorrow. And we'll make that decision later in the week." The Eagles have officially ruled Wentz (back) out for Sunday's game against the Rams, Zack Rosenblatt of NJ.com reports. Updating a previous report, Wentz (back) is listed as doubtful for Sunday's game against the Rams, Daniel Gallen of The Harrisburg Patriot-News reports. Coach Doug Pederson said Wentz (back) is dealing with a "stress injury" that has "evolved over time" and is questionable for Sunday's game against the Rams, Mike Kaye of NJ.com reports. Wentz was diagnosed with a fractured back vertebrae after receiving a CT scan Thursday, Adam Schefter of ESPN reports. Wentz will undergo an MRI on Thursday as the Eagles look to determine the extent of the back injury he's nursed for several weeks, Adam Schefter of ESPN reports. Wentz (back) has yet to be ruled out for Sunday's road game against the Rams, Rob Maaddi of the Associated Press reports. Wentz (back) isn't expected to play Sunday against the Rams, Ian Rapoport of NFL Network reports. 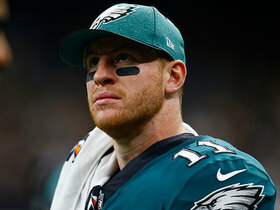 Wentz is dealing with back soreness and tightness and won't participate in practice Wednesday, Daniel Gallen of The Harrisburg Patriot-News reports. Analysis: Coach Doug Pederson characterized Wentz's absence as more of a rest day but also was unwilling to commit fully to the quarterback suiting up Sunday against the Rams. The Eagles likely will take a day-to-day approach in evaluating Wentz this week before ultimately rendering a verdict on his status. Nick Foles will earn the first-team reps at Wednesday's practice and would draw the Week 15 starting nod if Wentz isn't able to give it a go. Wentz completed 22 of 32 pass attempts for 228 yards and three touchdowns in Sunday's 29-23 loss to Dallas. Wentz completed 27 of 39 passes for 306 yards, two touchdowns and an interception in Monday night's 28-13 win over the Redskins. He also threw a successful two-point conversion. Wentz completed 20 of 28 passes for 236 yards and a touchdown in Sunday's 25-22 win over the Giants. Analysis: Wentz turned in another lackluster statistical performance, but he did just enough to lead his team back from a 19-3 deficit. His touchdown pass was a 15-yarder to tight end Zach Ertz with 1:04 remaining before halftime. Wentz has posted his two lowest passing yard totals of the season and just a 1:3 touchdown to interception ratio over the past two weeks, so he'll be looking to bounce back in Week 13 against the Redskins. Wentz completed 19 of 33 passes for 156 yards and three interceptions during Sunday's 48-7 loss to the Saints. He added a 6-yard run. Wentz completed 32 of 44 pass attempts for 360 yards, two touchdowns and an interception in Sunday's 27-20 loss to the Cowboys. Wentz (back) completed 21 of 30 passes for 286 yards, three touchdowns and one interception while adding 28 yards on six rushing attempts and losing a fumble in Sunday's 24-18 victory over the Jaguars in London. Wentz (back) was a full participant in Thursday's practice. Wentz (back) was a limited practice participant Wednesday but is expected to log full sessions Thursday and Friday, Tim McManus of ESPN.com reports. Analysis: Wentz dealt with the same back issue last week and ultimately suited up in Sunday's 21-17 loss to the Panthers, completing 30 of 37 passes for 310 yards and two touchdowns. He should be ready to roll for the Week 8 matchup with the Jaguars in London. Wentz completed 30 of 37 pass attempts for 310 yards and two touchdowns Sunday against the Panthers. He also carried three times for three yards and lost a fumble in the 21-17 loss. Analysis: Wentz completed an impressive 81 percent of his attempts as he surpassed 300 passing yards for the third time in the last four games. He did lose a fumble at one point, but he went without an interception and now sports a shiny 9:0 TD:INT over his last four games. Wentz has done little as a runner and has just 61 rush yards to his name through five games, but he's clearly rounded into top form as a passer. He'll look to put on another strong performance Sunday against the Jaguars. Wentz (back) was a full practice participant Thursday, Reuben Frank of NBC Sports Philadelphia reports. Analysis: As expected, Wentz followed up a limited session Wednesday with an unhindered one Thursday, confirming that his back issue is minor. His preparation will turn to Sunday's matchup against the Panthers, whose defense has allowed 278.3 passing yards and exactly two touchdown passes per game to quarterbacks over the last four contests. Wentz was limited at Wednesday's practice due to a back injury, but he's expected to resume full participation Thursday, Dave Zangaro of NBC Sports Philadelphia reports. Analysis: It's unclear if Wentz acquired the minor injury during last Thursday's 34-13 win over the Giants or at some point thereafter. Whatever the case, Wentz reportedly isn't in any danger of missing Sunday's game against the Panthers. Fantasy owners who have been relying on Wentz will still want to check Thursday's injury report to make sure his return to full participation goes as planned. Wentz completed 26 of 36 passes for 278 yards with three touchdowns and no interceptions in the Eagles' 34-13 win over the Giants on Thursday. He also gained 14 yards on two rushes and fumbled once but recovered. Wentz completed 24 of 35 pass attempts for 311 yards and two touchdowns during Sunday's 23-21 loss to the Vikings. He also carried five times for 26 yards and lost a fumble in the game. Wentz completed 33 of 50 passes for 348 yards and two touchdowns during Sunday's 26-23 overtime loss in Tennessee. He also rushed for eight yards and fumbled during the contest. Wentz completed 25 of 37 passes for 255 yards, a touchdown and an interception during Sunday's 20-16 win over the Colts. He added 10 yards on three carries and lost a fumble. Wentz is expected to be a "full go" in practice this week and face no restrictions Sunday against the Colts, Mike Garafolo of NFL Network reports. Wentz (knee) has been cleared to start this coming Sunday's game against the Colts. Analysis: The return of Wentz should provide the 1-1 Eagles with a nice boost, but in his return to game action he'll be throwing to a depleted wideout corps that has yet to welcome Alshon Jeffery back from shoulder surgery and is now without Mike Wallace (ankle) indefinitely. Wentz (knee) is on track to return to action Week 3 against the Colts, pending final medical clearance, Adam Schefter of ESPN reports. Wentz (knee) could be cleared to return to contact drills at some point during the upcoming week, Ian Rapoport of NFL Network reports. Wentz (knee) is expected to remain inactive for the Eagles' Week 2 matchup with the Buccaneers after head coach Doug Pederson named Nick Foles the team's starting quarterback Wednesday, Dave Spadaro of the team's official site reports. 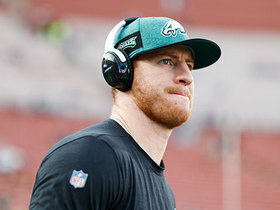 The Eagles don't appear to have a firm target date for Wentz's (knee) return to game action, with the quarterback seemingly "a couple more weeks" from playing, Mike Garafolo of NFL Network reports. Wentz (knee) could be cleared to make his season debut as soon as Week 3 against the Colts, according to Chris Mortensen of ESPN. "There is much more optimism that prevails than pessimism," Mortensen said, when speaking about Wentz's status Sunday on ESPN's "NFL Countdown" broadcast. "[Wentz] hasn't been ruled out for Week 2, hasn't been cleared, I think the organizational sources I spoke to say they wouldn't be surprised if he's ready for Week 3." According to Ian Rapoport of NFL Network, Wentz (knee) isn't expected to return for "several weeks." The Eagles ruled out Wentz (knee) for Thursday's game against the Falcons, Zach Berman of The Philadelphia Inquirer reports. Analysis: Philadelphia will open its title defense without the No. 2 overall pick from the 2016 draft, who wasn't along for the ride in the playoffs due to the torn ACL that he suffered in Week 13. Although he was a limited participant in practice this week, Wentz has yet to be cleared for contact. Until he reaches that final step in his recovery effort, the Eagles will hand the reins of the offense to Nick Foles. Wentz (knee) practiced in a limited fashion Monday, Adam Caplan of SiriusXM Radio reports. Analysis: The Eagles have already opted to roll with Nick Foles in Week 1, taking the advice of the team's medical staff regarding Wentz's recovery from his Week 13 ACL tear last season. It's unclear if Wentz's participation Monday included contact, but receiving a limited tag likely indicates he hasn't taken that step. Wentz's (knee) teammate, Nick Foles, is slated to draw the start at QB for the Eagles in Thursday's season opener against the Falcons. Analysis: Confirmation of this outcome seemed inevitable, but the Eagles are wisely proceeding cautiously here, with the big picture in mind for Wentz. It remains to be seen if Foles' run as a starter runs beyond Week 1, but the team is of no mind to rush Wentz back, with a very capable backup in Foles on hand. Wentz (knee) still hadn't been cleared for contact as of Sunday morning, Mike Garafolo of NFL Network reports. Analysis: Coach Doug Pederson admitted as much at his Sunday media session, yet also expressed frustration with a recent report that said Nick Foles will start Thursday's season opener against Atlanta. Pederson still isn't ready to make an announcement on a starter, though his comments from last week suggest he's already made the decision privately. The team may wait until Thursday for the official announcement. The Eagles plan to start Nick Foles over Wentz (knee) in Thursday's season opener against Atlanta, Ian Rapoport of NFL Network reports. Analysis: The majority of Philadelphia beat writers expected Wentz to get the nod, but it isn't too surprising that a loaded Eagles team will take the more cautious approach. There hasn't been any word on whether Wentz or Nate Sudfeld will serve as the No. 2 QB to open the season, but we should have an update once the team provides confirmation of Foles getting the Week 1 start. Coach Doug Pederson said he will privately make a decision by Friday between Wentz (knee) and Nick Foles for the Week 1 start against Atlanta, PennLive.com's Daniel Gallen reports. Wentz (knee) has not been cleared for contact, Jeff McLane of The Philadelphia Inquirer reports. Analysis: Wentz isn't expected to play in Thursday's preseason finale, and his window of opportunity to gain clearance for Week 1 is narrowing in advance of the season opener Sept. 6 against Atlanta. The 25-year-old has already acknowledged that his Week 1 availability will be a close call, with the final decision likely being made by the Eagles' medical staff. The team has a capable (and healthy) backup in Nick Foles, who seems to have the coaching staff's trust despite looking lost this preseason. Coach Doug Pederson relayed Sunday that Wentz (knee) is "where we wanted him to be at this stage," but the QB isn't expected to play in the preseason, the Eagles' official site reports. Analysis: Though Wentz has not yet been cleared for full contact, he'll "jump back into some team drills" Sunday, according to Pederson. In doing so, he'll split first-team reps with Nick Foles, who will practice despite suffering a shoulder strain Thursday. Wentz recently acknowledged that his Week 1 availability will be a close call, but the franchise signal-caller continues to progress well and his status for the Eagles' opener ultimately figures to be determined by the team's medical staff. Wentz (knee) will resume 11-on-11 work Sunday, Chris Mortensen of ESPN reports. Wentz (knee) acknowledged Tuesday that his Week 1 availability will be a close call, Dave Zangaro of NBC Sports Philadelphia reports. "It's going to be close," Wentz said. "It's going to be close. I'm still eyeing that date. At the end of the day, it's not just my decision. There's coaches and doctors that really have the final say. I really like where I'm at and time will tell here." Wentz (knee) is throwing with more velocity at training camp than he did in 2016 or 2017, Jimmy Kempski of PhillyVoice.com reports. "Those are things we track actually with the footballs and things that we have," said coach Doug Pederson. "We can monitor that stuff. Velocity has been up, accuracy has been up. Those are the things he's been able to work on over the course of the year." Wentz (knee), who won't play in Thursday's preseason opener, may not take a snap during the Eagles' exhibition slate, Zach Berman of The Philadelphia Inquirer reports. Analysis: As he bounces back from a torn ACL in his left knee, Wentz remains limited some in practice. The QB's stated goal of playing Week 1 has not changed, however. Such an outcome hinges on him gaining clearance to participate in full-team drills once again. Working in Wentz's favor on that front is that he's avoided any setbacks in his recovery thus far. Wentz (knee) was held out of full-team drills Friday for a fifth consecutive day, Mike Garafolo of NFL Network reports. Wentz (knee) was limited to individual side work at Tuesday's practice, Tim McManus of ESPN.com reports. Wentz (knee) took part in contact drills this week for the first time since tearing his ACL back in December, Jeff McLane of The Philadelphia Inquirer reports. Analysis: The Eagles will remain cautious regarding Wentz's rehabilitation process, but it's a good sign to see the training wheels are close to coming off. The progress has been quick, as it was only Wednesday that Wentz first took part in teams drills. It's still early and there's a lot that can happen between now and the start of the regular season, but Wentz is inching closer to putting this gruesome injury in his rearview mirror. Wentz (knee) took part to 11-on-11 drills Thursday, Mike Jones of USA Today reports. Wentz (knee) will open training camp Thursday by participating in individual and 7-on-7 drills, Chris Mortensen of ESPN reports. Analysis: Avoiding the PUP list is a significant development for Wentz, who suffered a torn ACL and additional damage to his left knee Dec. 10. 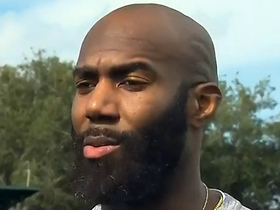 Both the player and team have expressed confidence in the quarterback recovering in time for Week 1, but the nature of the injury is such that that isn't a guarantee. Wentz actually took part in 7-on-7 work during the offseason program, so the next step will be progressing to team drills, which will be determined via consultation with the Eagles' medical staff. Eagles coach Doug Pederson still isn't sure if Wentz (knee) will be ready for Week 1, Peter King of NBC Sports reports. "I can't say," said Pederson. "I don't know now. I can tell you it's not going to be a Doug Pederson decision. It will be a doctors' decision. Carson will have to be 100 percent before he takes the field. I am going to rely totally on my medical staff." Analysis: Rehabbing from a torn ACL accompanied by other damage in his left knee, Wentz seemed to be ahead of schedule in early June when he took part in 7-on-7 drills at the final round of OTAs. While his rehab process is coming along faster than expected, the nature and timing of the injury will make it tough to forecast his Week 1 status until the start of the season is much closer. It's unclear if Wentz has a realistic shot to take part in 11-on-11 contact work early in training camp. Eagles head coach Doug Pederson said Wednesday that Wentz (knee) has begun participating in 7-on-7 drills during Philadelphia's offseason program, Zack Rosenblatt of NJ.com reports. Wentz (knee) took part in individual drills during Tuesday's OTA session, The News Journal reports. Analysis: Wentz has yet to be cleared for team activities, but even participation during individual drills is a good sign for him a little over five months removed from a torn ACL. Backup Nick Foles will continue to guide the offense this offseason as Wentz progresses toward a return, but the second-year signal-caller expressed confidence in early May that he will be ready for Week 1. Wentz (knee) said he is very confident he will be ready for Week 1. Wentz said Tuesday that he has begun the running portion of his rehab from a torn ACL in his left knee, Jeff McLane of The Philadelphia Inquirer reports. Eagles head coach Doug Pederson said Tuesday that Wentz (knee) won't join the team for its offseason program during the spring, Zach Berman of The Philadelphia Inquirer reports. Wentz, who is bouncing back from a torn ACL and LCL, posted a video of himself throwing inside the Eagles' practice facility Monday, Tim McManus of ESPN.com reports. Eagles executive vice president of football operations Howie Roseman said Wednesday that he was uncertain that Wentz (knee) would be ready to start Philadelphia's season opener, Eliot Shorr-Parks of NJ.com reports. Wentz is expected to start weight-bearing exercises on his left knee Wednesday, Ian Rapoport of NFL Network reports. Wentz, who is bouncing back from having his ACL and LCL repaired, believes that he'll be ready in time for the start of the 2018 campaign, CBS Philly reports. Eagles owner Jeffrey Lurie said Wednesday that the surgery Wentz (knee) required to repair a torn ACL went "very well," Ian Rapoport of NFL Network reports. 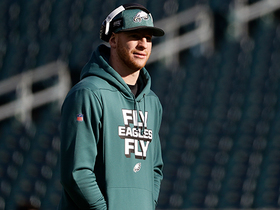 Analysis: Wentz wasted no time in going under the knife, as his surgery came just two days after he was diagnosed with the ligament damage in his left knee. Lurie said that Wentz opted to have the procedure done as quickly as possible so he could begin rehabbing in advance of the 2018 season. It's too early for the Eagles to offer up a firm timetable for Wentz's return, but even if he makes a speedy recovery, he'll still likely face limitations on some level when training camp opens in the summer. Wentz underwent surgery in Pittsburgh on Wednesday to repair the torn ACL in his left knee, Chris Mortensen of ESPN reports. The Eagles placed Wentz (knee) on injured reserve Tuesday. Wentz will undergo surgery on the torn ACL in his left knee in "a couple of days," Chris Mortensen of ESPN reports. Wentz suffered a torn ACL and won't play again this season, Jeff McLane of The Philadelphia Inquirer reports. 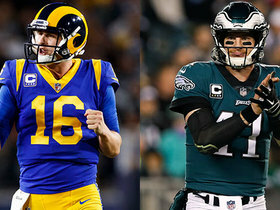 Initial evaluations of the left knee injury Wentz sustained in Sunday's 43-35 win over the Rams didn't reveal a complete tear of the quarterback's ACL, Ian Rapoport of NFL Network reports. Wentz will undergo an MRI on Monday as the Eagles look to gain more clarity regarding the severity of his injury. Eagles coach Doug Pederson declined to discuss Wentz's knee injury after Sunday's 43-35 win over the Rams, merely saying that the quarterback will have an MRI on Monday, Martin Frank of The Delaware News Journal reports. The Eagles fear that Wentz (knee) suffered a torn ACL, Adam Schefter of ESPN reports. Wentz has been ruled out of Sunday's road matchup with the Rams due to a knee injury. Wentz completed 29 of 45 passes for 348 yards, one touchdown and one interception during Sunday's 24-10 loss to the Seahawks. He added 30 rushing yards on six carries while losing one of two fumbles. Wentz completed 23 of 36 passes for 227 yards and three touchdowns, adding five carries for 29 yards, in Sunday's 31-3 win over the Bears. Wentz completed 14 of 27 passes for 168 yards, two touchdowns and two two-point conversions during Sunday's 37-9 victory over the Cowboys. He added 13 rushing yards on six carries. Wentz completed 15 of 27 passes for 199 yards and four touchdowns in Sunday's 51-23 romp of Denver. He added eight yards on the ground. Analysis: Wentz could have padded his numbers had he not been pulled in the fourth quarter with Philly up by multiple scores. Wentz looked like he was playing chess while a top-10 Broncos defense was playing checkers, selling a number of play fakes before connecting with his targets on numerous downfield throws. After taking some lumps earlier in the season, Wentz has now tossed 17 touchdowns against just three picks in his last five games and looks like a bonafide MVP candidate heading into the the bye. 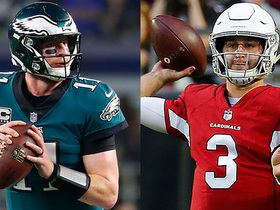 NFL Network's Dan Hanzus, Chris Wesseling and Marc Sessler highlight potential comeback stories to watch out for over the course of the 2019 NFL season. 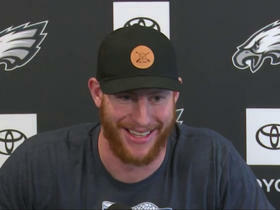 Philadelphia Eagles quarterback Carson Wentz addresses the media about his health and expectations for 2019. NFL Network Insider Ian Rapoport reports the latest on the Philadelphia Eagles' contract talks with quarterback Carson Wentz. The "Good Morning Football" crew debate if Philadelphia Eagles quarterback Carson Wentz is under more or less pressure if Nick Foles leaves the team. Philadelphia Eagles quarterback Carson Wentz discusses his injury history during his young NFL career. NFL Network's Mike Garafolo discuss the report from the "Philly Voice" about Philadelphia Eagles quarterback Carson Wentz and how he gets along with his teammates. 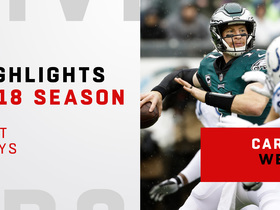 Watch Philadelphia Eagles quarterback Carson Wentz's best plays from his 2018 season. Philadelphia Eagles head coach Doug Pederson discusses his team's quarterback situation with Carson Wentz and Nick Foles moving into the 2019 NFL season.